Having worked with many seniors, I’ve noticed that many of them have shallow breathing, i.e., small, short breaths, and they breathe through their mouths. I have also heard comments from other health professionals who work with seniors, especially physiotherapists, that many seniors have shallow breathing. This makes it more difficult to get them to walk or do other exercises. Shallow breathing isn’t just a problem for seniors. Most of us have shallow breathing. Many of us, especially women, also hold our breath for short periods of time when we’re in stressful situations. Most of the time, we’re not even aware that we’re doing it. Our breathing is also shallow if we’re trying to have a flat stomach. What are the health effects of shallow breathing? Shallow breathing and holding our breath increases stress hormones in the body. The body associates shallow breathing with the fight-or-flight response. Shallow breathing causes stress and stress causes shallow breathing. Over the long term, shallow breathing and stress become habits for the body and mind, leading to health problems, such as a weaker immune system because shallow breathing reduces the number of lymphocytes (white blood cells) in the body. It makes us prone to more illnesses from which it takes us longer to recover. Shallow breathing can also make respiratory problems worse, cause dry mouth and panic attacks, make us feel tired, and eventually lead to heart problems. When our breathing is shallow, we’re using the muscles in our shoulders, neck, and chest to draw air into the lungs. Breathing this way can change our posture by making the shoulders slump forward. It can also cause headaches and neck pain. Deep breathing is breathing using the diaphragm. When we do deep diaphragmatic breathing, our chest expands as well as our belly. Deep breathing will help you feel more relaxed, decrease your heart rate, lower your blood pressure, and make you feel more grounded and energetic. For people with anxiety, it will make you feel less anxious. What is the proper way to do deep breathing? The proper way to do deep breathing is to inhale into the belly through the nose for five seconds or so, hold the breath for two seconds or so, and exhale for six or seven seconds. The reason for holding the breath briefly is to allow carbon dioxide to form so you avoid hypocapnia (too little carbon dioxide in the blood), which can cause you to feel lightheaded, weak, and faint. If you breathe in and out deeply without holding the breath, you exhale more carbon dioxide than your body has had a chance to create, which can cause an imbalance. This is especially true for people with anxiety who have a tendency to hyperventilate (take quick and shallow breaths). Recent studies show that breathing in through the nose improves cognitive function. That’s a good reason to stop breathing through your mouth! To make sure you’re using your diaphragm when inhaling, take a deep breath in through the nose with one hand on your chest and the other hand on your belly. You should feel the hand on your belly expanding as you breathe in. As someone with a long history of anxiety, I have found deep breathing to be extremely helpful. Whenever I feel my breathing is shallow or that I’m holding my breath, I make a conscious effort to take a few deep breaths. This allows me to practise mindfulness throughout the day and helps me feel more calm, relaxed, happy, and alert. 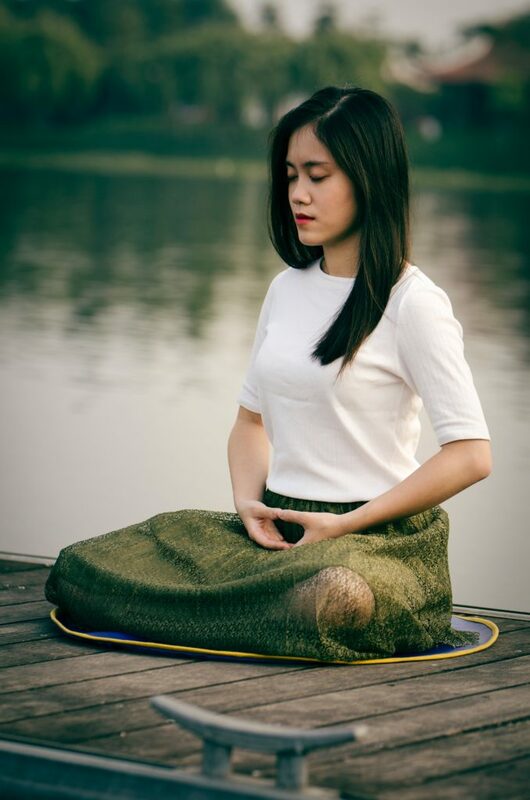 It comes as no surprise that singers, stage actors, elite military personnel, and Olympic athletes consider deep breathing to be one of the most important things they do. I remember a yoga instructor telling us on the last day of class, “No words of wisdom, just breathe.” It was actually very wise advice.